A B-26 attempting to land at Portland Airport in heavy fog crashed into a government trailer park for shipyard workers across from Redbank Village. 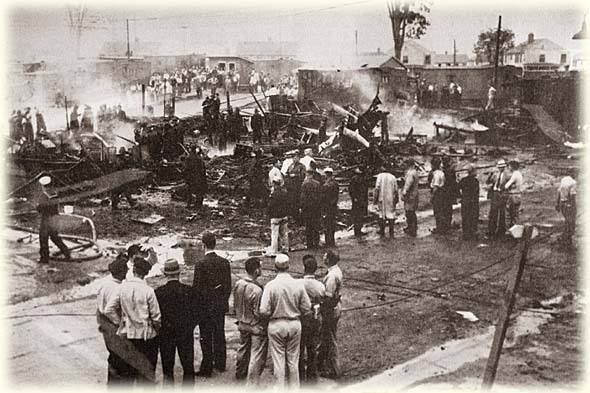 Both crewmen aboard the plane were killed, along with 17 people on the ground. Another 20 were seriously injured. The summer of 1944, with heavy wartime training and ferry traffic, saw more aircraft accidents in Maine than any other period. The second worst air disaster in Maine occurred on the same day! A B-17 crashed into Deer Mountain. near Rangely killing all 10 aboard. Lest we forget- many airmen died in stateside training mishaps during WW II as well as in combat. Saint John Pond. It is reported that at least two of them are still out there. 2. T-33A involved in a mid-air collision with an F-102 near Flagstaff Lake in 1959. 3. F-106A in Caswell March 1966. 4. B-52G in Caswell 1969. 5. RCAF Digby 1940 near Little East Lake. 1. T-33 on Pleasant Mountain in Denmark. 2. F-101B on Mount Abraham in Kingfield.